It’s Deceuninck-Quickstep versus the rest again this Sunday as the home team take on all comers, including Peter Sagan, Greg Van Avermaet, Wout van Aert and Oliver Naesen. It’s live on TV from start to finish and takes plance in front of an estimated million of roadside fans, an event of national importance to the Belgians. The Route: 270km and not quite full tour of Flanders, the race starts in Antwerp and then heads south-west to reach the finish town of Oudenaarde before 100km are covered. From here the race starts looping around the the hills of the Flemish Ardennes. Viewed on a map the route resembles a ball of wool and includes a large finishing circuit. The Cobbles and the Climbs: one reason why the race cirles around a small area is so that can take in as many of the hellingen as possible, the short climbs that make the race; the second constraint is laps to pass the copious VIP tents. The climbs are technical and tactical both the ascent and the approach and it’s all about positioning where everyone wants to be at the front because if a rider ahead has a mechanical, crash or merely slows it takes a lot of effort to overtake as accelerating on cobbles or uphill uses so much more energy. Watch for the density of riders at key points in race, the racing is fierce just to reach the start of these strategic sections with riders fighting for place, almost a combat sport. The Kapelmuur comes with 95km to go and the race tends to heat up from here on. 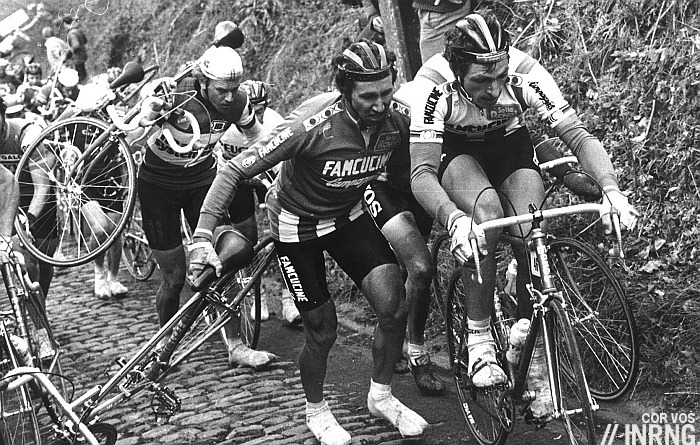 The Koppenberg (45km to go): “discovered” in 1976 when a local informed race organisers about a narrow cobbled climb with a 22% gradient and rough cobbles. It’s often damp on a dry day. Dropped for being too dangerous in 1987 race it’s made a comeback and features late in the race. It’s probably the hardest climb of the day and if it doesn’t pick the winner it thins the field. Look to see who emerges over the top and how smooth they look on the way up while behind many will wear down the infamous stones with their cleats, countless images from the past show riders running up because they could not ride. Oude Kwaremont (150km, 56km and 17km to go): the odd one out as it’s not short, it’s not steep and it’s not all cobbled. Instead it’s 2.2km long and a meagre 4.2% average; it touches 11% midway. If 2.2km doesn’t sound like much, it’s an effort of more than five minutes of which four are spent on the pavé making it a tiring boneshaker. Paterberg (52km to go, 13km to go): the Kwaremont is chased by the Paterberg, it’s only 400m long but is short, steep and very cobbled. It’s not a normal road, it was inspired by a local farmer who suggested laying cobbles on what was a farm track in a bid to lure the race. It works and is VIP central today, it’s lined by fans who enjoy a giant screen TV and beers – this is the final climb of the race. The 20% slope has broken many a rider with 240km in their legs. The Finish: the last section from Kerkhove to Oudenaarde is eight kilometres long on a flat wide road all the way to the line. The most unremarkable of roads, there are no sharp corners, roundabouts or hills. The featureless nature matters as it’s long enough to allow riders to regroup and offers no ambush opportunities for a late attack. The final kilometre has the tiniest of rises to the line. 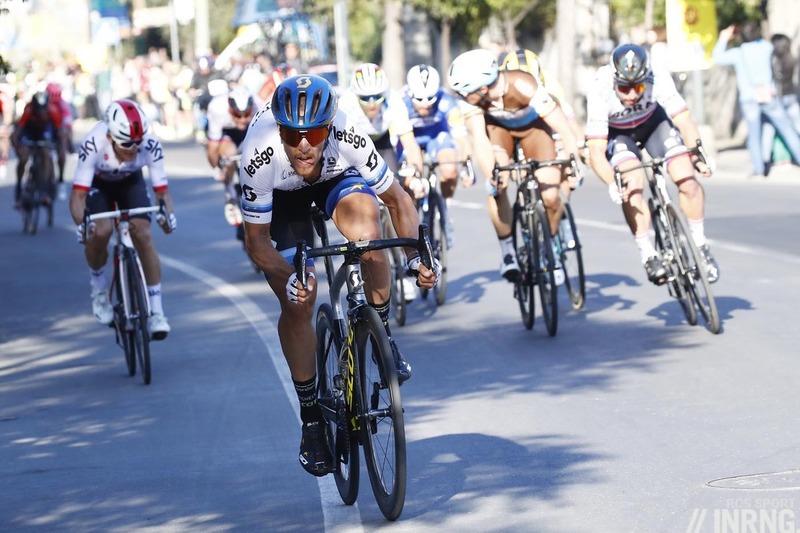 Deceuninck-Quickstep have had a great spring campaign and will deploy the same tactic of “optionality”, firing riders into the lead so they can profit from any scenario that develops and if the move fails, then another rider goes up the road to see what happens. They have four leaders with Zdeněk Štybar , Yves Lampaert, Philippe Gilbert and Bob Jungels. Strong but none of these names looks like a certainty if a group larger than three or four riders arrives for the finish. Jungels is likely to try and go solo, Yves Lampaert too as he is strong but how to win, he doesn’t seem explosive enough? Gilbert has been ill in recent days but insists he’s fine now but it’s not reassuring which leaves Štybar as the most versatile pick as he’s in form, victorious and handy in a small sprint but it’ll depend on the scenario. It’s 2043 and Greg Van Avermaet is in his late 50s with a dense thatch of grey hair. He walks into a bar in West Flanders and an elderly patron sat at the bar spins around, spots him and says “Jonge, you’re the guy who won Paris-Roubaix, wore the yellow jersey, won the Olympics, the Omloop, the E3 and stage races like Tirreno-Adriatico and the Tour of Belgium”. “Ja” says Van Avermaet, smiling with his chest swelling ever so slightly with pride. The elderly drinker turns to the barman, shakes his head and mutters “but he never won De Ronde” before returning to his pintje. Three times on the podium already and more top-10s too but no win and these days GVA is 33 years old and his CCC team isn’t so strong as the BMC days. Often generous in a breakaway rather than crafty, like we saw in the Omloop this year, he’s still a strong pick and a chance of never having to buy a beer again in Flanders awaits if he can seize it. Talking of nearly men, Peter Sagan (Bora-Hansgrohe) has won so much but he’s also lost plenty too and as L’Equipe’s Philippe Brunel likes to write, the Slovak belongs to the cast of riders like Eddy Merckx who make the headlines for winning and losing alike, see Sanremo where Sagan’s clumsy sprint was part of the day’s story. Bora-Hansgrohe are strong but Sagan doesn’t look so sharp, he said to be aiming for upcoming classics but if so then each day brings him close and if he’s a couple of kilos lighter all the better for the bergs. It’s said cycling is becoming increasingly specialised and that teams are forced to choose their goals. But Jumbo-Visma compete on all fronts whether grand tours, short stage races, bunch sprints and the classics too. New signing Wout van Aert gives them a strong chance. Ninth last year in his first attempt, he’s powerful for these climbs and has a good sprint. Oliver Naesen is out to prove you can have too much champagne, saying he caught a cold after being doused in wine during the E3 podium celebrations last Friday. He’s still a contender but loses a chainring because of the uncertainty but has been having a strong classics campaign, his best so far. 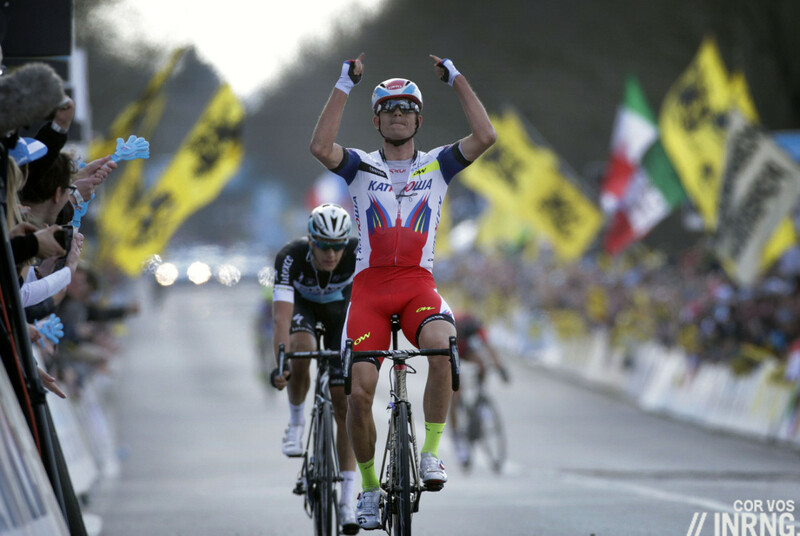 2015 winner Alexander Kristoff (UAE-Emirates) popped up to win Gent-Wevelgem last Sunday, his first win in a spring classic… since 2015. But look at the photo above and he was a leaner build then and the Ronde’s course is likely to be too much for him, especially the Kwaremont-Paterberg combo. Last year’s winner Niki Terpstra took an impressive solo win but in part because of Quickstep’s tactics so it won’t be so easy this time. Still his team should be satisfied so far thanks to two podiums already by the Dutchman and he seems to have helped raise the level with Anthony Turgis taking another podium in Dwars door Vlaanderen and Adrien “the Bison” Petit riding like he used to. Terpstra’s still in with a shot and his ability over the Kwaremont-Paterberg combo gives him a chance if the move hasn’t gone by then. Sep Vanmarcke starts for EF Education First and this is news after a sore knee put this in doubt. He hasn’t finished a race since Tirreno-Adriatico which could mean he’s as fresh as waffle off the press but equally short of depth. Alberto Bettiol is a strong rider with power and endurance but one problem, he’s never won a race as a pro. Veteran Sebastian Langeveld could feature too. Lotto-Soudal bring the tandem of Tim Wellens and Tiesj Benoot but the risk for them is they come up a bit short here and again in the Ardennes. For neutrals there’s a good chance of action as they’re frequent attackers who enliven a race. Neither are sprinters but after 260km could still have a chance. Team Sky have a strong team on paper. Luke Rowe has been featuring in the classics but converting this into a result is his challenge meanwhile Dylan van Baarle and Gianni Moscon look like prototype riders for de Ronde only they’ve only returned racing recently after crash injuries. They’ll probably aim for a strategy à la Quickstep of putting riders up front and seeing what happens. Trek-Segafredo have a good team on paper too, hopefully they stop experimenting with touring drivetrains because time is running out for a squad with strong classics ambitions but little to show. John Degenkolb looks better and better this spring and Jasper Stuyven needs to catch a break, literally as he could go in a move 50-30km from the finish. Mads Pedersen (pictured) had been on the radar for some time but went prime time last spring and if the results have been discreet this year, he’s looked strong, take his breakaway in Tirreno-Adriatico where he showed the kind of staying power that got him into second place in the Ronde last year. Mathieu van der Poel is a hot pick thanks to his Dwars Door Vlaanderen win on Wednesday but note that’s a race often accessible to younger riders, as the big riders back off ahead of this Sunday. But the case for him would argue he’s winning despite a light Correndon-Circus team and he’s got a very fast sprint which he can deploy even after he’s towed a breakaway to the finish. He showed in Gent-Wevelgem he can handle the distance too. Team Sunweb bring Michael Matthews who’s bounced back from injury to score two stage wins in last week’s Volta a Catalunya and is the dark horse pick for Sunday. On paper he’s made for the sharp bergs and obviously has a good sprint. But is he a Flandrien? 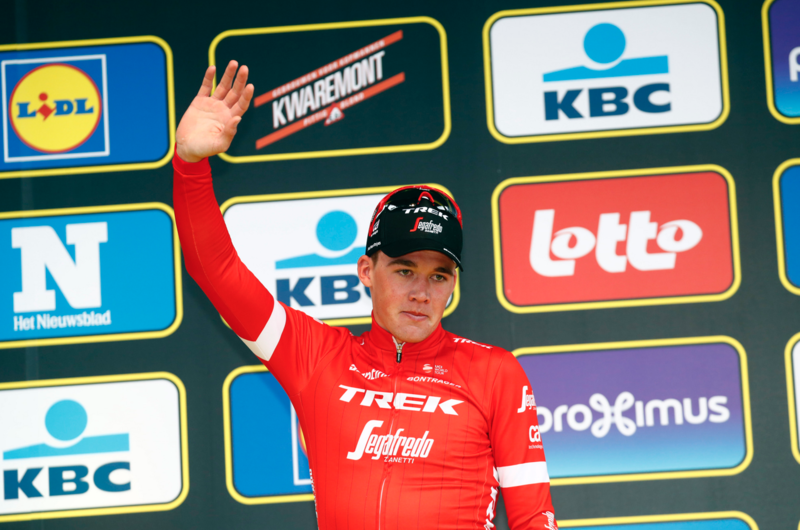 Many of his wins come from warmer climes and smoother roads and when he’s won in Geraardsbergen… it’s been on a summer’s day in the Eneco Tour. Søren Kragh Andersen is an outsider too. Alejandro Valverde hasn’t come to Flanders for a cone of frieten and mayo days a few days short of his 39th birthday but as we saw with Vincenzo Nibali last year, he might feature but it’s hard to see him winning especially as he’s never ridden this race before although the finishing circuits make the race more predictable for him and, whisper it, he hasn’t looked quite like el Imbatible of old. Movistar’s new signing Jürgen Roelandts has been ill and so not the force Movistar hoped for while strongmen Imanol Erviti and Jasha Sütterlin offer support. Among other teams Astana don’t look very imposing for once with Magnus Cort probably their best chance. Several teams have been out of the picture this spring, starting with Katusha-Alpecin and Nils Politt could feature but victory sounds hard; Groupama-FDJ’s Arnaud Démare fell ill in March and has been playing catch-up ever since with Stefan Küng a better pick for Paris-Roubaix; Matej Mohorič (Bahrain-Merida) is versatile and maybe their best pick. Dimension Data’s Michael Valgren and even Edvald Boasson Hagen could score but the team hasn’t featured much this year. Weather: mild with the chance of a rain. A top temperature of 18°C and a 10-15km/h breeze from the north means it should be a calm day weather-wise. TV: the whole race will be live from start to finish. The start is at 10.30am CEST and the finish is forecast for 5.10pm. Local host broadcaster Sporza/Een offers the best coverage with moto reporter Renaat Schotte’s observations, otherwise it’s on Eurosport across most of Europe, Fubo in the US and DAZN in Japan. Cyclingfans and steephill have links to schedules and streams too. Women’s Race: The final hour is live on Belgian TV (Canvas) and if readers share a good preview it can be added here. A tough race to call and I’d argue that there potentially isn’t any out and out 5 star favourite. The ‘Big 3’ of the last couple of years – Sagan, van Avarmaet & Gilbert – are all short of top form and none have been winning in bunches like in previous years. Stybar obviously has but perhaps lacks the star quality of those 3. Van Aert has probably been the only rider capable of living with Stybar on the bergs, and he might be feeling stung that van der Poel has come in and stole some of his ‘new young star from cross’ limelight. I fancy him to barge clear over the last couple of climbs and bring in the new era of van Aert and van der Poel. I also think there is a chance of the race being on from very early due to the success of Trek and Jumbo-Visma in putting Quick-Step under pressure at G-W.
It’s open like you say, I hesitated to use five chainrings for Štybar and GVA thinking maybe it should be blank as it’s uncertain but this meant the lower rankings got crowded with too many names. Hopefully it’s good to watch on Sunday, unlikely to be as windy as recent races. I agree, it feels like a very open race this year…I can’t help but feel that Stybar has relied on a dose of luck so far this spring, simply because he’s not normally a prolific winner so I struggle to see it continue into Sunday…GvA on the other hand has been quietly simmering away, looking very strong, but perhaps now being less hungry for victory in the smaller races? With Sagan seemingly off the boil, Quickstep feeling a little bit individually weaker than normal (but still strong as a team), and no other rider standing head and shoulders above the rest, GvA is my pick for victory. And I’d love to see him do it! You feel that the UK’s Brexit negotiators should watch road cycling, and the past week’s Gent – Wevelgem and Dwars Door Vlaanderen being prime examples of one-upmanship and it’s hazards and rewards. It’s hard to argue that Quickstep need a quick man finisher given their record but you still feel that someone like Van der Poel would fit them like a glove. Quickstep from distance or take your pick, I’d like to see Naesen or GVA or one of the young guns do it. Will van der Poel fully move to the road? As far as I’m aware, he’s always said he was happy staying in cyclo-cross and doing a bit of road on the side, but like van Aert he seems to have the potential to have a great road career. Supposedly he wants to ride MTB at the Tokyo Olympics before switching full time to the road. I’m not a fan of MVDP as I’ve always considered it a bit unfair if someone was born with so much more talent than others but if they bring him to the line in a group that will certainly be much smaller than the one in GWE then everyone else is probably sprinting for second. If he’s not boxed in I can see only Kristoff beating him in a sprint right now. But as INRNG I’m not sure that Kristoff will make it over the hellingen with the best. Especially as there will probably be even more attacks than usual tomorrow given that there are so many contenders and QS as the possibly strongest team can’t really wait for the sprint. What chain ring rating would Alaphilippe get if he were riding this race? Given his form and general all round ability I would predict 4. I wonder if he would consider this race in the future? He is a lighter rider but versatile and if he can win the Strade Bianche then this looks good for him too. Probably three chainrings but he’s been resting since Sanremo and will resume racing soon so if he was actually a sudden entrant for Deceuninck then it’d be a big ask. People like to ask if a rider can win all the five monuments and I think he’s most certainly of taking four with Roubaix being the difficult one. I’m looking forward to see how the ‘cross phenoms perform on this big stage, especially MvdP who will be in only his 3rd WorldTour race. Jumbo Visma has been looking sharp as a team and that has been good to see and good for the sport. Quickstep may have the deepest team, but as you say, they have no clear favorite and their tactics will be interesting to see. I think someone like Matthews or Naesen may take the win this weekend. Both in form, but slightly under the radar. Naesen is off nobody’s radar. Unless it’s broken and doesn’t show anything at all. Love the words on GVA! +1. Very inventive. Made me smile. + another. I do like your little excursions into fiction, IR, and I’m a huge GVA fan, but as you say, the man will probably have to buy his own beer forever. However, it’s nice to dream – some would say essential – so I’ll be cheering for Greg today. Rowe for the podium? … another dream. I’ve always been a bit neutral about GVA, but the scenario you’ve depicted above is simply heartrending. If I could be criticized for not having won the tour of flanders–or the equivalent in my field of work–I think I’d by my critic his next pint. I’d like to see GVA win too. Nice, what you said about Van Avermet. Interesting point about Kristoff. He definitely looks slighter in that photo. Watching him winch himself up the Kemmelberg and at a couple of other points in G-W he certainly looked a bit chunky. I dismissed it at the time as maybe the result of the super tight skinsuits they wear now combined with a big intake of air into very large lungs. He said last week after the race that he went ahead over the Kemmelberg as a defensive move so he would not be dropped, he knew he was too heavy. He’s had some criticism over his weight from team management but his reply is he knows what he is doing and can get results in the classics. He had so much more power than the rest at the end of E3. I have the distinct impression that as soon as it gets windy like in E3, a bit more mass is a big plus. I can imagine that the lighter you are, the more energy you waste on maintaining your balance. But it worked. He does look huge. I’m the smallest of the group of Flandriens I ride with. Most of them at least 15 kg over my weight. Most of them faster up these cobbled climbs than me anyway. Kristoffs weight is the same as when he won RvV i 2015. Last year he was 2 kgs lighter and had a not so good year. And if you see him with a bare upper body you will notice that he is not fat. He is a big boy with a lot of muscle. Thanks for a dose or reality in a world where I start thinking some of the comments come from teenage anorexic girls. One note about Nibali last year at The Ronde – I seem to remember him being sick on the day, and he’s not the kind of guy (IMHO) to just say that to cover for a less-than-stellar performance. My point is that should not affect the chances of The Green Bullet so I’d give him chances at least as good as Vanmarcke or Rowe for sure. I can’t comment on Kristoff’s weight, but he does look a good deal more slight in the picture above than he did at G-W the other day. Plus, he never used to need a lead on the main favourites over a berg – he won the Ronde in a break with Terpstra and stayed with him. Rowe has looked strong whereas Vanmarcke has been injured and Valverde is light and new to the race, and has never done much on cobbles, so I can’t put the latter two in anywhere near the same bracket as Rowe. Rowe’s record isn’t anything to write home about either and he’s nowhere near a favourite, but he’s looked strong. Larry T – standing up for big boned cyclists around the world! Nelson Oliveira (Movistar) looked very strong Wednesday – I wonder what might have happened had he not punctured. Sagan appears to have lost his cobbled climbing legs – let’s hope they return. Over at Steephill they have something I’ve wanted to see for years: a race profile that gives distances in km to go (rather than km completed), so it matches up with what you get on TV. No idea where they got it, I haven’t been able to find this image anywhere else. It is always frustrating having to do lots of calculations to work out where the riders are, much easier if the maps count down rather than distance from the start. I love this race! Less of a lottery than Paris-Roubaix, it is a race of truth. Only the strongest can win. I may just get up at 2:30am and watch the whole thing! With the trend of going earlier and earlier in these races, that points to a very hard race, which will be great fun to watch. It will also be more selective. So who IS the strongest? Team-wise Quickstep, obviously. But the other teams may have unlocked the secret to defeating them. However, I can’t think of any team with a combo as good as Jungels/Stybar. You cover Jungel’s long-range attack, and Stybar sits on the wheels for an arm chair ride to a sprint win. It’s a great strategy that will be hard to beat. None of the other favorites have this option, except maybe Wellens/Benoot? So who can go long range and still sprint for the win? Mathieu van der Poel, Peter Sagan, and Greg Van Avermaet look like the best options, but they all have question marks hanging over them. So my pick for the podium, in no particular order, is one of the Quicksteppers, one of the three above, and a total surprise, like Mads Pederson last year. I would like to see Sagan blow the cobwebs off and Mitch up his first Classic of the season, perhaps followeed up by la pascale as he is one of my favourite riders of all time. Last season he just started to lose 10% from that turbo diesel of his, and just like an ageing car he’s unable to quite get that top end of his. Hopefully that was just a blip, though his form seems to have suffered since the split from his wife. The length of this race favours some of the more experienced riders, but I have a gut feeling we might see someone show for the first time. It’s nicely set-up for a revelation. Not sure I’d go with 5 rings for Stybar or GVA, but Inrng is rarely wide of the mark. I guess if Alaphilippe is a prime pick, but is absent then Jungels has to be the man?! His main problem is that he often seems sacrificed for more senior riders. ‘la pascale’ – who is this? Less who and more what, it’s a label sometimes given to Paris-Roubaix as it sometimes used to be run on Easter Sunday. This just made my week. Chapeau mate. The description is so evocative it’s like you’re there in the pub. Yep, and you gotta know he’s thinking (but can’t say) “OK, sure, but I won a hell of a lot more races than you ever have, even in your imagination you f—king wanker!” while wondering where British Eurosport finds these people. I still remember Stephen Roche back in the David Duffield days saying (after we’d complemented him on his insightful commentary but wondered why he didn’t say more) that he would love to say more, but the deal was to pinch Duffers on the wrist to shut him up so he could get a word in…but he said he often pinched and pinched, but Duffers just wouldn’t shut up! Not too long afterwards, Roche was outta there. How long will Kelly put up with it? Perhaps you weren’t around for Duffers and Roche? He seemed to get on well with ol’ Duffers until he left. Same old, same old – what they say on TV or in front of an audience is often far different than what they say in a more private setting. And perhaps Kelly needs the money more than Roche did? You may well be right, on both counts. From my limited knowledge I believe Kelly gets on with most people, Vanderarden excepted! Though even that enmity seems to have cooled over the years. Kelly doesn’t strike me as being naturally loquacious. He has a limited vocabulary, possibly an inheritance from a rural Irish upbringing, which doesn’t suit prolonged conversation. I must say that I feel that the art of cycling commentary is under-rated. Being able to sit (sometimes on your own) and talk about cycling for 3-4 hours is a tough ask. I appreciate both David Duffield and Carlton Kirby for doing so, bringing relative interest and enthusiasm to their monologues. I know others here wish they had something more inciteful to say at times, but it’s hard to speak to both those who are new and old to cycling. If criticism can be levied it’s that the analysis provided post race is often lacking in depth. I would challenge Eurosport to get someone like Cyclocosm to do this rather than Greg Lemond. Having just listened to a substantial chunk of Rob Hatch’s 7hrs(!) of commentary on the Ronde I can only admire the skill and stamina involved in calling a cycle race. It was an incredible performance, with an honourable mention for Rob Hayles as co-commentator too. True, it was the only monument the great Sean Kelly never, second twice?, but seeing as the commentator is Carlton Kirby, a man famous for nothing, other than being very, very fat, I’d tend to pass this by. It would be nice though if post the inevitable, annoying, Kirbyism, we hear the sound of a breaking nose bridge. Normally I’m strictly non-violent, but I can overlook this in the case of Kirby. Is this the pub on the Kapelmuur we are all imagining? Mvdp will win barring bad luck – he’s on another level. Stybar 2nd. Van Aert 3rd. CX takeover. That may just happen. Those 3 have been very impressive this year. Also keep in mind that van der Poel has done fewer racing kms than almost anyone else. He said before the racing season that he didn’t expect to be in peak shape until Brabantse Pijl and AGR. He also said those 2 races suit him best. So expect him to get better over the next few weeks. So excited. The highlight of the cycling year. Heart says WvA, head says Quickstep. The best man will win no doubt. Them cobbles tho… first time I’ve ridden them and they really take it out of you, even the flat bits. I’m not in sunny Belgium but I am in sunny northern England. And, after a tootle out for a few hours this afternoon, I can also reveal that fly season is back too. Cobbles, bergs and flies. Nice. Thick clouds most of the day in Belgium. Of flies? Or potential precipitation? Hope you enjoyed it. Conditions in the event are often relayed for the race, the story goes that when Museuuw won solo he got his info on the course conditions from someone who rode the previous day. Is it not true that nobody has won omloop and the ronde in the same season, or have I got that wrong? So far, yes. The idea is that to be strong in the end of February means you’re stale come April but it should be possible. Not this year though as we now know. Discounted styby cos of this. Made my first pilgrimage to Kapelmuur today. Felt good, not because of my form but because people cheared me on thinking I might be participating in the Junior’s race held today. I’m 33. There was stiff breeze in the area today. Borderline bordure conditions. Veranda Willems boys passed me nose breathing on the steeper section. Are they riding it? I remember reading an interview with Fuglsang on his training while at Astana, and he mentioned this as a technique ‘ride a really hard gear you can barely pedal to increase strength’ or something like that. I tried it one day and it was not fun. Already been a lot of comments in here about Kristof, but here is one more. I find it interesting to look at the disconnect between Inrng’s predictions (to win) and bookmakers odds (chosen to make/not loose money). For this race the standout anomoly is Kristof at 33-1. Ranked lower than Kwait who isn’t even in the race! The other is Pederson at 40-1. Not saying they will win, but seems like a good value bet compared to MVDP and Styber who are around 4-1. Especially if you go ‘each-way’ (top3). Both these riders have shown strong form and won/placed high in recent races and also in previous Ronde’s. Now I’m hoping for lashing rain and an bitter cold icy wind. 4-1 is insanely bad odds for a one-day race. I’m with you on the weather: the cobbles have been a little disappointing thus far this season and I think the weather hasn’t helped. I noticed earlier in the race – it was after an hour or so – that Wout van Aert’s total wattage in the race up to that point was 224, whereas Sagan’s was 198. I don’t usually put much stock in these stat’s, but could that be a sign of experience – Sagan saving his legs better? Just realised that Inrng had him on the radar (but no chain ring). Lovely move to pull away. The favourites all stood still and waited for someone else to chase. That was some final five km. Apparently Sean Kelly tipped him to win. Well, not anymore. Well deserved.